Amanda Faber's family is the focus of her "Bread Week" showstopper bake. 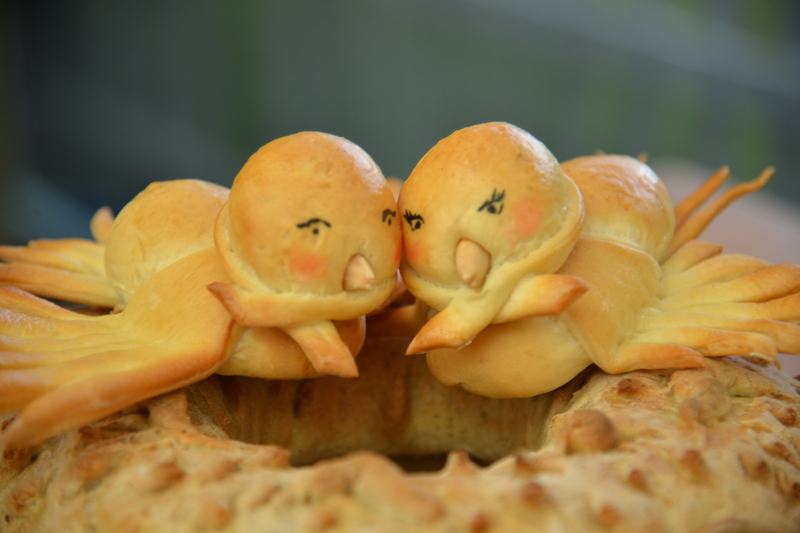 In a gesture of love for her husband, Amanda's showstopper bake features two turtle doves in a love nest. Amanda soars to new baking heights by nesting her birds in an intricate rye dough wreath. Baking at times is a struggle and Amanda strives to make her Two Turtle Doves Love Nest recipe perfect. Learn how to make Amanda's recipe below. Watch the full "Bread Week" episode from Season 2 Episode 3 of The Great American Baking Show to see if Amanda's bake was a hit. 1. In the bowl of a stand mixer fitted with a dough hook, combine 125g of the all-purpose flour, rye flour, bread flour, salt, Herbs de Provence, water, and yeast. 2. Mix slowly until a dough forms, the faster as it comes together. Use hands to gather and scrape as needed. 3. Cover with a tea towel for 2 hours, until doubled. 4. Once doubled, chill in refrigerator 1 hour, until cold. 5. Once chilled, return to stand mixer and incorporate remaining 110g of flour. 6. Knead by hand or machine until it forms a smooth dough. 7. Cover again and chill for 30 minutes. 8. Just before the chilling time is over, place a jelly roll pan on the bottom rack in the oven. Preheat the oven to 475° F/246° C.
9. On a floured surface, stretch the dough in to a heart shape. It should be about 12 inches wide at the widest part, and the center area should be about 4-5 inches across. 10. Rest for 15 minutes. 11. Move the wreath to the back of a jelly roll pan. 12. Cut the wreath with scissors to create foliage. Rest for 15 minutes. 13. Pour remaining 2 cups of water in the pre-heated pan. Bake wreath on the jelly roll pan for 20- 25 minutes. Tent with foil if the points are brown before the bread is baked. 14. Decorated with doves and shapes when it is finished baking. 1. In the bowl of a stand mixer fitted with a dough hook, combine the melted butter, sugar, yeast, water, and milk. 2. Combine the flour and salt in a medium mixing bowl. 3. Add the flour and salt. Knead until the dough is smooth. 4. Cover with a towel for ~1 hour, until doubled. heads with an almond for a beak. 6. Roll the rest of the dough flat. Cut in to small shapes to decorate wreath. 7. Pre-heat the oven to 350° F/177° C.
8. Mix the egg with a splash of water. Brush lightly on all shaped dough. 9. Bake for 15 minutes. Watch closely and cover parts with foil as they begin to brown. 10. After they are baked, place two cloves on each bird head for eyes, and attach heads to bodies with toothpicks. 1. Preheat the oven to 500° F/210° C.
2. Combine the rosemary and flour in a mixing bowl. 4. After the yeast is active and foamy, add the dry ingredients to the wet ingredients in the stand mixer bowl. 5. Mix to combine. Add in the salt. Mix to make the dough. 6. Knead the dough until no longer sticky. Form in to a ball. Place in a bowl, covered with a tea towel, until doubled. 7. Without punching the dough down, spread it on a lightly floured surface to create a large flat piece. Cover and rest for 5 minutes. 9. Bake until golden brown, 10-15 minutes. Add water to pan in base of oven to create a crispier crust.